Johnny Depp was voted as sexiest man in the world 2009. It is the second time for Depp (46 years old and father of two children) was elected as the sexiest man, the first was in 2003. 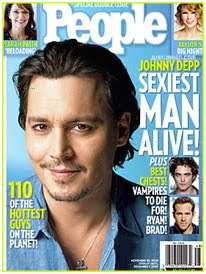 Johnny Depp also join with George Clooney and Brad Pitt for chosen as the sexiest man twice. The election was conducted by People magazine. Depp became famous after acted as detective in the series 21 Jump Street. Besides Depp, there are some male celebrities who have the predicate as the sexiest man, namely Ryan Reynolds, Jake Gyllenhaal, Bradley Cooper, David Beckham, Gilles Marini, Nick Cannon, Chris Daughtry and Robert Downey Jr..